It's October! I can't believe how fast this year has flown by! So happy to have a little cooler weather around these parts, even though here in Florida we never get the typical fall weather it does feel nice to have a lot less humidity in the air. With Halloween just around the corner, I thought it would be fun to gather up some of my favorite Halloween decor inspiration. I have to admit, I haven't been a fan of decorating for Halloween in the past, but since my little one has started to get more excited about holiday's I thought it would be fun for him to start a little Halloween decorating tradition going. I've gathered some of my favorite ways to sprinkle a little Halloween throughout your home without going too crazy with the scary stuff since my little one is still quite small. How cute are these?! As soon as I saw these, I just knew that I had to include them. Courtney from A Diamond in the Stuff shows you how she made these without spending an arm and a leg, because who wants to spend a fortune on holiday decor??! The foam pumpkins came from the dollar store and she painted them white. Add some BOO letters she cut from the Cricut and done! So cute! If you don't have the candle sticks, you could buy cheap ones at the dollar store as well and spray paint them black. Such a simple and perfect DIY for the Halloween season! Decorating for Halloween doesn't necessarily mean pumpkins, ghosts, or scary stuff. 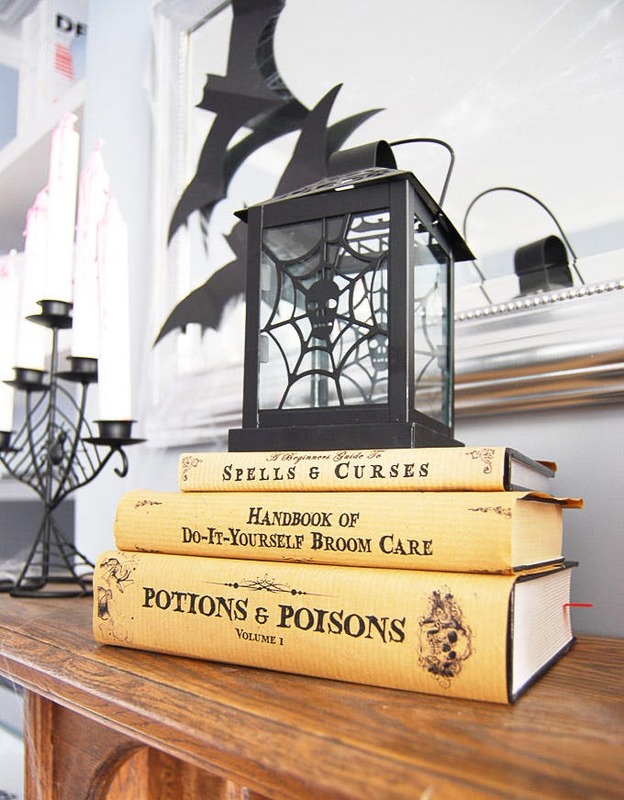 By simply adding touches of black and white throughout your home is not only is it chic, but with a little Halloween decor throughout, it can look amazing and festive! Emily and Sarah from Boxwood Clippings created such a cute little corner with some black and white throw pillows and a bat garland. Simple yet so cute for Halloween! And those throw pillows can also be used throughout the seasons by adding different pops of color. So versatile, love! If you have been following me for a while, you guys know that I absolutely love using free printables to help decorate my home. So when I ran across FREE Halloween book covers from Little House on the Corner I just had to include them. How awesome are these?! I love that you can print them on book brown paper to give them that aged look. Such a cool and easy way to add a little unexpected Halloween decor to your space. And best of all, it's free and super simple! Don't Forget about your Front Porch! How beautiful is this front porch?! Ballard Designs does it once again with beautiful decor. I always tend to stop at their site or scour their catalog for ideas. They can be a little pricey sometimes but it is ALWAYS a good place to get inspiration and try to think of ways to replicate the look for a lot less. 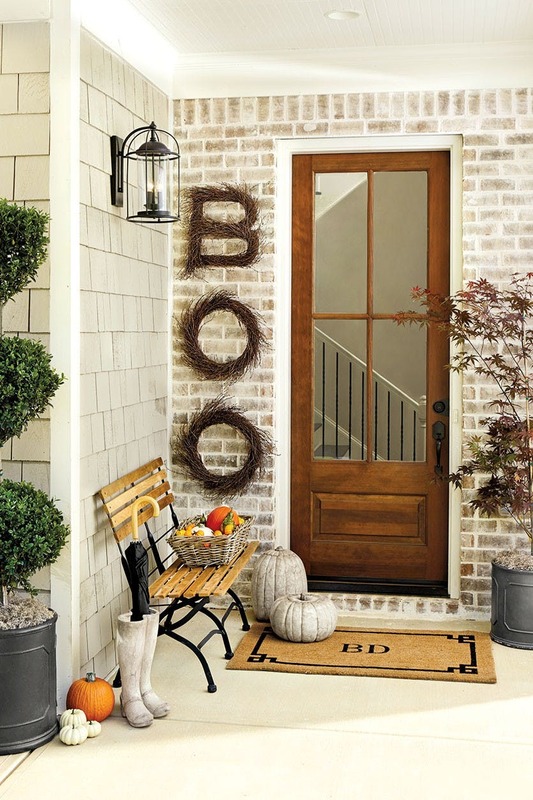 You could replicate this look with a little paint and some Dollar Tree pumpkins to create the weathered pumpkin look. The BOO wreaths could be replicated by going to the craft store and getting some grape vine wreaths. I have seen Hobby Lobby sell the grape vine letters for the 'B' and you're all set! You too can have an amazing, festive, front porch with a little imagination and a few DIY's! If you aren't a fan of decorating with black and white and you prefer the more traditional color of Halloween, orange, you too can also create a beautifully decorated home for Halloween. If you don't believe me, check out Craftberry Bush where she uses all the typical fall colors to create a beautifully decorated home for the season. I absolutely love all the touches of orange and red throughout her home. And the orange pumpkins inside the glass terrariums? Perfection! Another great, inexpensive way to decorate for Halloween around your home is to invest in some dark flowers. Real or faux, the choice is yours! (Check out my post on how to make faux flowers look real!) A Kailo Chic Life shows us just how fun decorating with flowers can be for Halloween. The large black flowers add so much moodiness and drama to the space, just what you want for Halloween! And the dark, colorful flowers add just the right amount of color. Add some traditional Halloween decor like bats and skulls and you've got a beautifully styled bar cart for Halloween! I hope that you guys found this post useful! I had so much researching all the creative ways to decorate for Halloween. It definitely has helped me get in the mood of Halloween decorating and I can't wait! Leave me a comment below and let me know how you like to decorate for Halloween?